ONE LANE AT A TIME! 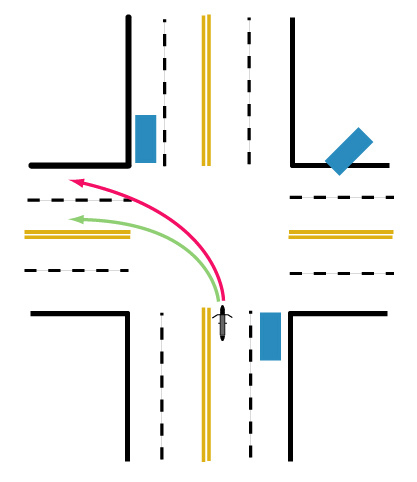 It seems perfectly obvious to me that when you make a lane change you should do it one lane at a time. That is, you signal, do a head check, then change your lane. If you want to move more than one lane then you repeat that process for each lane you move. Well, when you are at an intersection and make either a right or left turn you are making a lane change. DO IT ONE LANE AT A TIME. You should take the path in green, NOT the path in red. There are three vehicles in this graphic that can run over you if you take that red path. The one in front of you can make a left turn, the one coming at you from the left (coming out of the gas station lot) can 'see you' and try to avoid you by going into the faster lane, and the car immediately to your left can decide to make a right turn while you are doing the same. 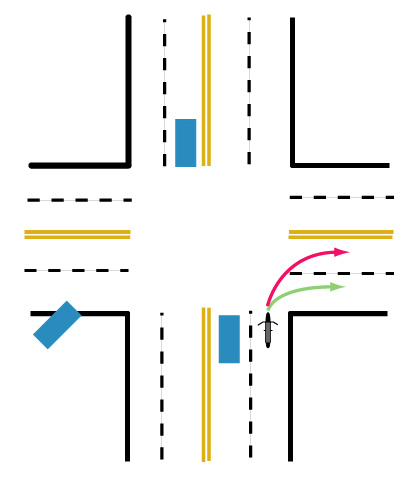 Similarly, when making a left turn there are three vehicles that could run you over if you insist on being lazy and doing a multiple lane change instead of one. Does it matter which one you end up under?